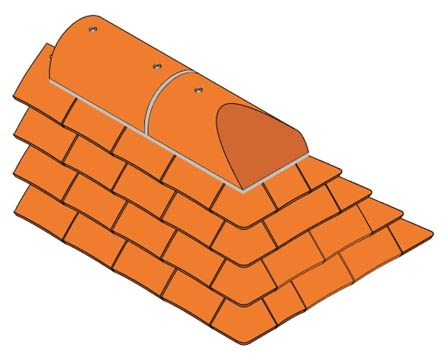 This drawing shows an example of a gable stop end ridge tile. These are commonly used at the gable in conjunction with bedded verges and avoid the need for a deep bed of mortar underneath the end ridge tile . All ridge tiles must be mechanically fixed to the roof structure. 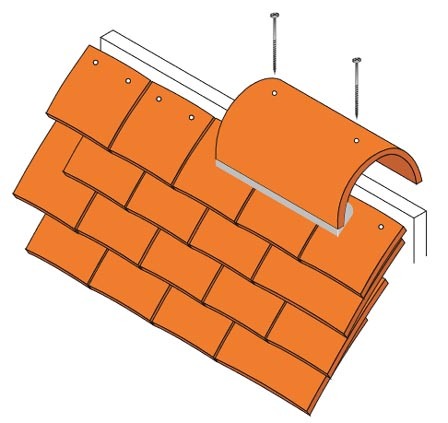 This drawing shows an example of a gable block end ridge tile. These are commonly used at the gable in conjunction with cloaked verges, although they can also be used with bedded verges to avoid the need for a deep bed of mortar underneath the end ridge tile . This drawing shows an example of a hip end. These are commonly used at the junction between a ridge and hips, which bonnets, arris hips or a mitred hip have been used. A suitable lead saddle (not shown) should be fixed underneath the end ridge tile to weather the ridge/hip junction. 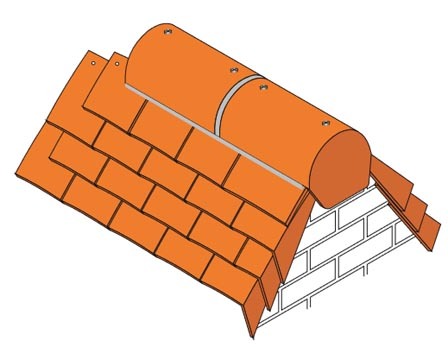 This drawing shows an example of a mechanically secured ridge tile using nails or screws with sealing washers. Some Dreadnought ridge tiles must be drilled, others are manufactured with holes. Where the ridge tree is absent, or of insufficient height or width to accommodate the fixings, it will be necessary to fit an additional ridge timber. Where using this method of mechanically fixing in conjunction with mortar bedding it is better to use screws rather than nails to avoid the risk of dislodging the mortar during fixing. 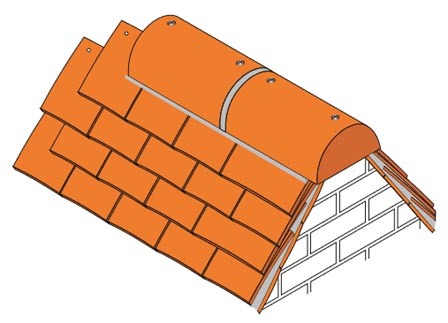 This drawing shows an example of a mechanically secured ridge tile using a metal strap inserted into a recess at the end of the ridge tile and secured to the ridge timber. 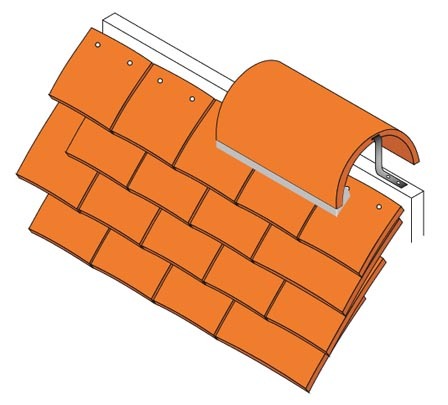 This method of fixing requires the manufacture of special ridge tiles. 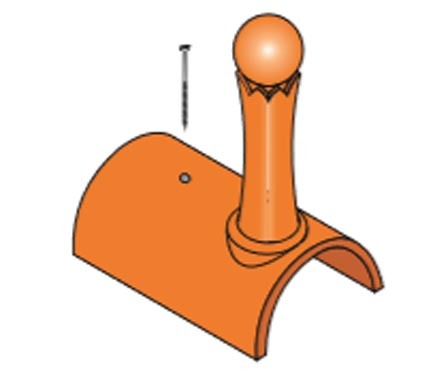 In this example the finial has a hole to enable it to be nailed or screwed to the ridge batten. 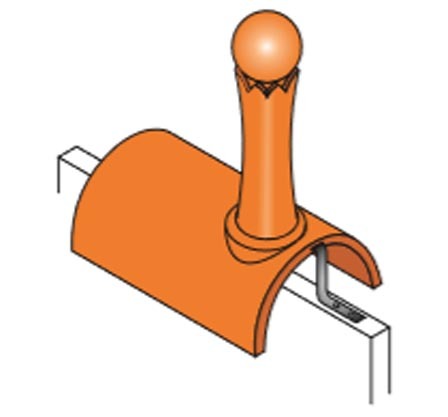 In this example the finial has a threaded bar embedded in it to enable it to be bolted through a suitable hole in the roof structure; for example, through a hole drilled in the ridge batten. 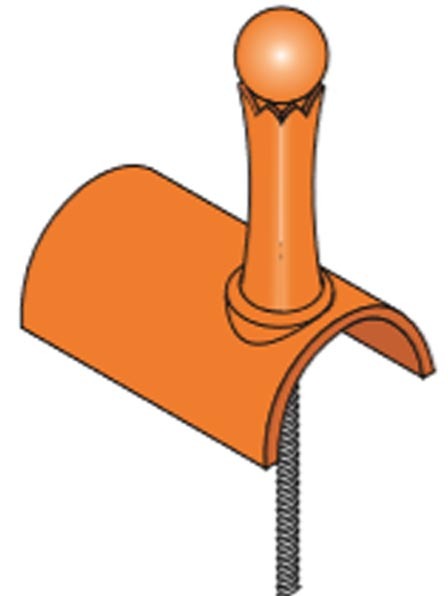 In this example the finial has a metal strap inserted into a recess at the end of the finial and secured to the ridge timber.